There are many important sites for Buddhist Pilgrimage in India. Considered important among them are the ones where the Buddha was born, Lumbini, where he attained enlightenment, Bodhgaya, where he first preached Saranath and the place where he died, Kushinagar. The next four important pilgrimage sites are associated with great miracles performed by the Buddha. They are Rajgir, where the Lord tamed a mad elephant, Vaishali, where a monkey offered honey to him, Sravasti, where the Lord took his seat on a thousand petaled lotus and created multiple representations of himself, and Sankasya, where he descended from heaven. Together these 8 holy places are called Atthamahathanani. In this list the later additions are Kapilavastu, the place of his childhood, Kaushambi, the place of several sermons in the 6th and 9th years of enlightenment, Kesariya, the place where the Buddha gave his begging bowl to the people and Nalanda, the place where the history of monastic establishment can be traced back to the days of the Ashoka. Lumbini is situated in the foothills of the Himalayas, in modern Nepal. 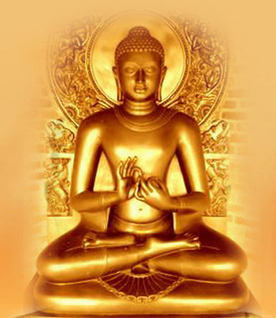 The Shakya Prince Siddhartha or Gautama, better known as the Lord Buddha was born in Lumbini during the full moon day in the month of Baisakh (May) in 623 B.C. Lumbini, the place of birth, is one among the four sacred pilgrimages of the Buddhists. In 1997, Lumbini was declared a UNESCO World Heritage Site. Bodhgaya, is the holiest of the four holy places of Buddhism. Situated by the river Niranjana, it is where Lord Buddha left his footsteps nearly 2500 years ago while travelling in the quest of enlightenment. It was here under a banyan tree, (the Bodhi Tree); Siddhartha Gautama attained supreme enlightenment to become the Buddha, (the Enlightened One). 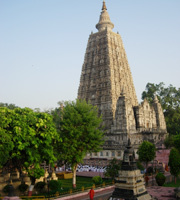 Bodhgaya is considered as the holiest of the holy Buddhist pilgrimage. The majestic Mahabodhi temple behind which stands the Bodhi Tree which originates from the original sapling still stands to date. In June 2002, the Mahabodhi Temple was declared a UNESCO World Heritage Site. Located just 12 km from the Hindu holy city of Varanasi, is the deer park of Sarnath, where after his enlightenment, the Buddha first preached the Dharma and the Buddhist Sangha first came into existence. It is one of the four holy places of Buddhism.